As soon as Oprah Winfrey concluded her powerful speech at the Golden Globe Awards on Sunday night, a lot of people had thoughts, which mostly went something like this: "So, she's running for president, right?" 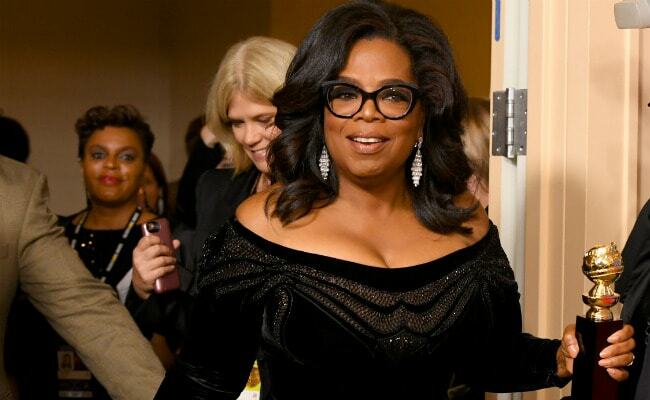 Although the TV mogul has said she doesn't have plans to run for office, she apparently hasn't ruled it out completely - which sent the internet into a frenzy on Monday, as many wondered whether "Oprah 2020" is a real possibility. "Yes, we can! Am I the only one who had that feeling? ... Feels like this is Oprah 2020. Whatever you do, though, Oprah, don't use emails!" "I can see how Oprah seems like the perfect opponent for Donald Trump. I mean, she's everything that he's not. She's black, she's a woman, she likes to read. They're the complete opposite. I bet if we looked into it, we would find out that Donald Trump once repossessed 100 people's cars." "Did anybody see last night's episode of 'Oprah'? It was so great. Now, some people are calling it the Golden Globes." "People were immediately calling that speech 'presidential.' And a year ago, I would have agreed. But these days, it plays a little coherent." "Oprah is denying any political ambitions, but two of her close friends told CNN she is 'actively thinking' about running for president. Now, I'll tell you, it's interesting. I, for one, would love to hear that the state of the union is stroooonnng!" "But I offer a note of caution: Do we really want to elect another billionaire TV star? Granted, this one is actually a billionaire and actually a TV star." "A lot of people think Oprah belongs in government. For instance, Donald Trump does. (Shows 1999 clip of Trump saying he would choose Oprah as his running mate.) If you need any more proof that Trump is delusional, he thinks Oprah would take vice president." "On hand to receive the Cecil B. DeMille award was none other than Oprah Winfrey, who delivered a powerful speech. A speech so powerful that all day long, people have been asking if Oprah will run for president. Which at this point, wouldn't president be a demotion for Oprah? I feel like it would. But now that we have Donald Trump, everything seems possible. "Reporters asked the White House today for their response to a potential Oprah candidacy. Team Trump said, 'We welcome the challenge, whether it be Oprah Winfrey or anybody else.' Preferably anybody else. I mean, Trump's approval rating right now, I don't think he could beat Maury Povich for president, never mind Oprah." "Everybody's talking about the big speech Oprah made. And a lot of people are saying that maybe she should run for president. It'll be weird at her State of the Union when Congress keeps checking under their seats for a free car." "But this could be a big story. In fact, two of Oprah's close friends said that she's thinking about running in 2020. While two of Trump's close friends said, 'Please don't refer to us as 'Trump's close friends.' "
"People close to Oprah are saying that she could actually be convinced to run for president in 2020. Don't get too excited. Oprah hasn't said that she's decided to make a run for the White House or anything. She said she's not sure she wants to move into a smaller place." "Can you imagine Oprah as president? I mean, you thought Bernie Sanders wanted to give a lot of stuff away. 'You get health insurance! You get health insurance! You don't get deported! You don't get deported! You won't get deported!'" "The White House actually responded officially. They responded officially to the news that Oprah might run, saying, 'We welcome all comers.' Yeah, which is very easy to remember cause it's the exact opposite of their immigration policies."